, or Moses the son of Maimon, a celebrated rabbi, called by the Jews “The eagle of the doctors,” was born of an illustrious family at Cordova in Spain, 1131. 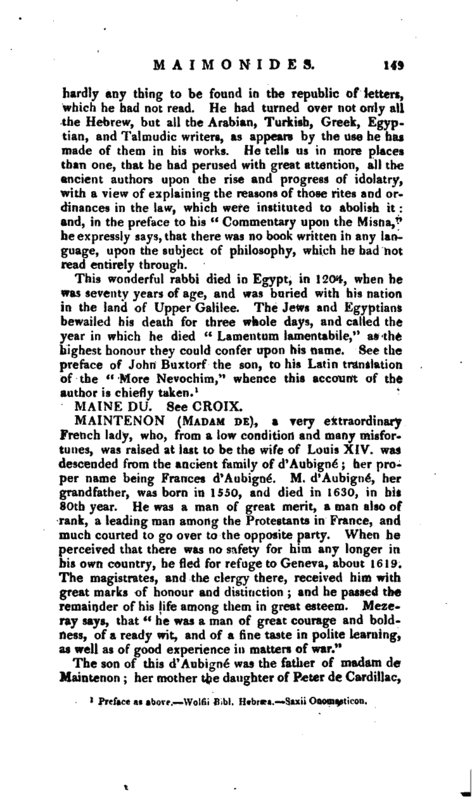 He is commonly named Moses Egyptius, because he retired early, as it is supposed, into Egypt, where he spent his whole life in quality of physician to the Soldan. As soon as he arrived there he opened a school, which was presently filled with pupils from all parts, especially from Alexandria and Damascus; who did such credit to their master by the progress they made under him, that they spread his name throughout the world. 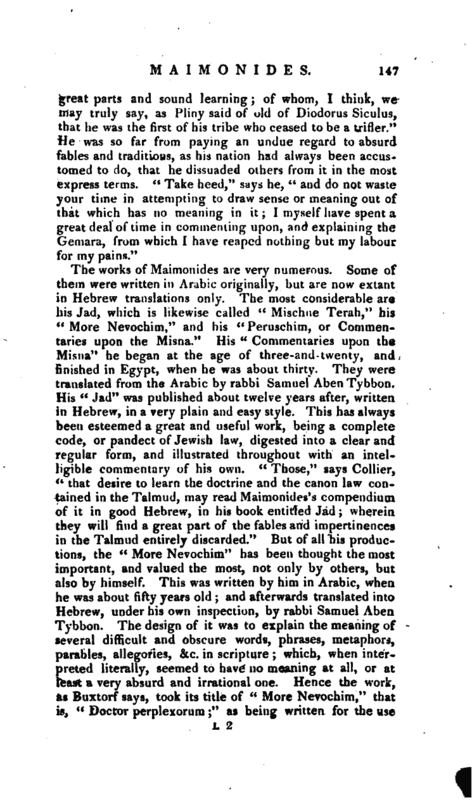 Maimonides was, indeed, according to all accounts of him, a most uncommon and extraordinary man, skilled in all languages, and versed in all arts and sciences. 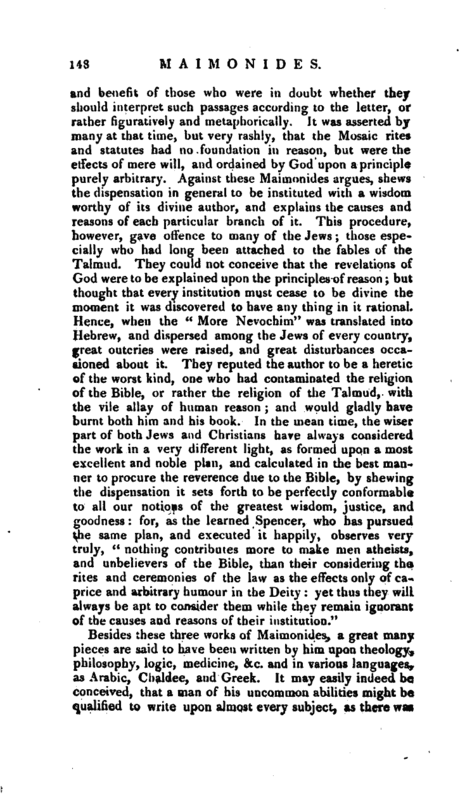 As to languages, the Hebrew and Arabic were the first he acquired, and what he understood in the most perfect manner; but perceiving that the knowledge of these would distinguish him only among his own people, the Jews, he applied himself also to the Chaldee, Turkish, &c. &c. of all which he became a master in a very few years. It is probable also, that he was not ignorant of the Greek, since in his writings he often quotes Aristotle, Plato, Galen, Themistius, and others; unless we can suppose him to have quoted those authors from Hebrew and Arabic versions, for which, however, as far as we can find, there is no sufficient reason. He was famous for arts as well as language. In all branches of philosophy, particularly mathematics, he was extremely well skilled; and his experience in the art of healing was so very great, that as we have already intimated, he was called to be physician in ordinary to the king. 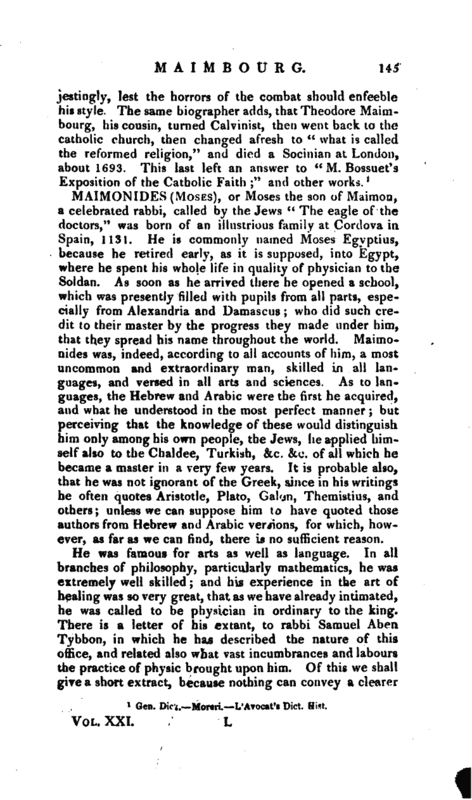 There is a letter of his extant, to rabbi Samuel Aben Tybbon, in which he has described the nature of this office, and related also what vast incumbrances and labours the practice of physic brought upon him. Of this we shall give a short extract, because nothing can convey a clearer | or a juster idea of the man, and of the esteem and veneration in which he was held in Egypt. Tybbon had consulted him by a letter upon some difficult points, and had told him in the conclusion of it, that as soon as he could find leisure he would wait upon him in person, that they might canvas them more fully in the freedom of conversation. 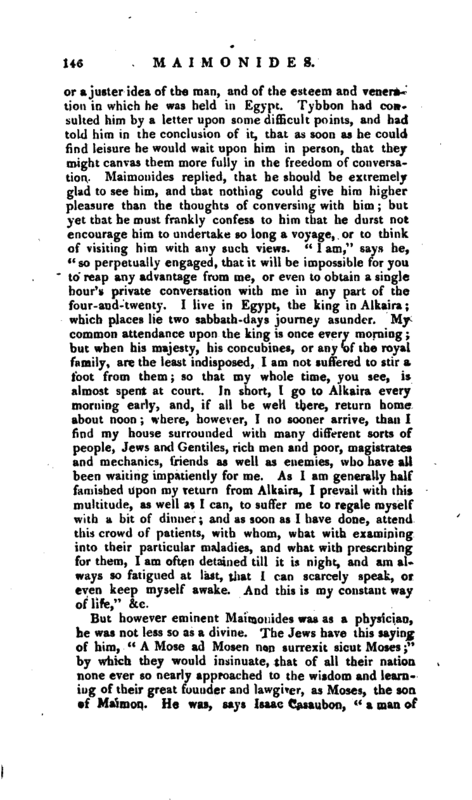 Maimonides replied, that he should be extremely glad to see him, and that nothing could give him higher pleasure than the thoughts of conversing with him; but yet that he must frankly confess to him that he durst not encourage him to undertake so long a voyage, or to think of visiting him with any such views. “1 am,” says he, “so perpetually engaged, that it will be impossible for you to reap any advantage from me, or even to obtain a single hour’s private conversation with me in any part of the four-and-twenty. I live in Egypt, the king in Alkaira; which places lie two sabbath-days journey asunder. My common attendance upon the king is once every morning; but when his majesty, his concubines, or any of the royal family, are the least indisposed, I am not suffered to stir a loot from them; so that my whole time, you see, is almost spent at court. In short, 1 go to Alkaira every morning early, and, if all be well there, return home about noon; where, however, I no sooner arrive, than I find my house surrounded with many different sorts of people, Jews and Gentiles, rich men and poor, magistrates and mechanics, friends as well as enemies, who have all been waiting impatiently for me. As I am generally half famished upon my return from Alkaira, I prevail with this multitude, as well as I can, to suffer me to regale myself with a bit of dinner; and as soon as I have done, attend this crowd of patients, with whom, what with examining into their particular maladies, and what with prescribing for them, I am often detained till it is night, and am always so fatigued at last, that I can scarcely speak, or even keep myself awake. And this is my constant way of life,” &c.
Besides these three works of Maimonides, a great many pieces are said to have been written by him upon theology, philosophy, logic, medicine, &c. and in various languages, as Arabic, Chaldee, and Greek. It may easily indeed be conceived, that a man of his uncommon abilities might be qualified to write upon almost every subject, as there was | hardly any thing to be found in the republic of letters, which he had not read. He had turned over not only all the Hebrew, but all the Arabian, Turkish, Greek, Egyptian, and Talmudic writers, as appears by the use he has made of them in his works. He tells us in more places than one, that he had perused with great attention, all the ancient authors upon the rise and progress of idolatry, with a view of explaining the reasons of those rites and ordinances in the law, which were instituted to abolish it: and, in the preface to his “Commentary upon the Misna,” he expressly says, that there was no book written in any language, upon the subject of philosophy, which he had not read entirely through. Preface as above. Wolfii Bibl. Hebraea. —Saxii Onomasticon.